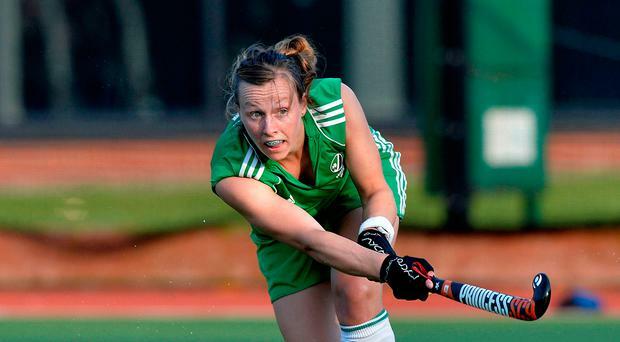 Megan Frazer finally made her comeback for Ireland after a lengthy injury lay-off in last night's 1-0 win over Chile in the opening game of the Three Nations series in Dublin. The 27-year-old Londonderry woman has undergone three knee operations in the past 18 months but now looks set to feature in the World Cup which gets under way in eight days time. Fellow Ulster girl Katie Mullan celebrated her 150th appearance in the green shirt with a win which came when Emily Beatty deflected in Hannah Matthews' cross in the second half. Ireland take on Italy tomorrow at Pembroke (2pm) to complete their preparations for the World Cup trip to London. Meanwhile, Ireland men had a decisive 5-1 win over the USA at UCD last night. Most of the goals came from Ulstermen, with Sean Murray opening the scoring after just 30 seconds by deflecting in Shane O'Donoghue's penalty corner and Eugene Magee getting the second barely a minute later. Garvey's Matthew Nelson set up Jeremy Duncan for the third and Magee got his second from a penalty corner. Paul Singh narrowed the gap but Garvey's Michael Robson made it five with a lovely shot on the reverse. The two teams meet again this evening at Pembroke (7pm).